All students earning a B.S. in Advertising receive a thorough education that combines experiential learning with innovative classes. The advertising curriculum is designed to provide a foundation for problem-solving, strategic thinking, and persuasion techniques that drive audience-centered marketplace communications. Alumni have graduated from this program and earned positions at some of the top agencies and companies in the world. These alumni have proven that with a degree from our program you have countless possibilities with what you can do. In the spirit of this, students have two track options to graduate with their degree: the Advertising Agency Track and the Persuasive Messaging Track. Students in the Agency Track receive a comprehensive education that helps prepare them for any entry-level agency role after graduation. Along with their core requirements, students choose 12 electives credits in the major. After completing the required prerequisites, students then take the Campaigns class, which allows them to experience agency roles and work hands-on before they graduate. An advanced advertising course requiring the student to prepare and produce a complete general advertising campaign. Emphasis is placed on production methods, costs, research and media analysis. Prerequisites: 4JM ADV; minimum grades of C or better in ADV 4101 and ADV 4300. 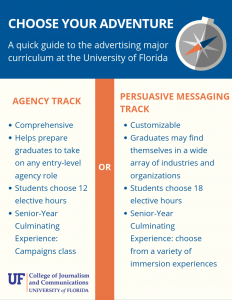 Students in the Persuasive Messaging Track have a more customizable educational experience, and graduating students may find themselves in a wide array of industries and organizations. Students will choose 18 electives credits after completing their core requirements. To graduate, students choose a class from a selection of immersion experiences based on their personal interests. These immersion experiences include courses that are more specific or experimental, as well as experiences such as an advanced internship. This culminating experience will take all of what a student has learned, weaving in electives and experience, and put it to use. Students choose one of the following three credit hour experiences to meet their graduation requirements. Focuses on two aspects of strategic communications. First: creating, developing and producing advertising and promotional content for real live case studies. Second: evaluating topical issues and industry innovation in media content innovation. Create either a competitive creative campaign for a real-world client or participate in a creative advertising competition. Hone creative skills and learn to prepare professional pitches or presentations. A structured internship program that is approved by the department as an immersion experience related to the field of advertising. Requires 65 hours of work per credit hour and submission of electronic portfolio including a culminating project from the internship. Prerequisites: 4JM ADV; 2.50 minimum professional GPA; minimum grades of C in ADV 3008, MAR 3023 and ENC 3254; and department permission. Offerings vary each semester. Click here to see the full list of CJC courses.